replicate a Fender Strat. headstock. Fortunately I had the equipment to accomplish this. Many people might not. I had no issue with this product. I took my time with the build and was completely satisfied with the appearance, and performance. I received the product amazingly quick … I have found that the router work to be excellent and the quality of the overall wood cuts to be excellent. The neck/fretboard I found to have an excellent feel not to thick and I was able to sand it to such a nice smooth feel get some great speed and movement along the neck. I found the frets to be smooth and not sharp or rough. Only time will tell if there will any shrinking in the neck cause edges on the frets. As for the hardware hat comes with it I have only used the bridge plate changing the saddles and the jack boat. I upgraded all other hardware. The hardware that comes with the kit .. 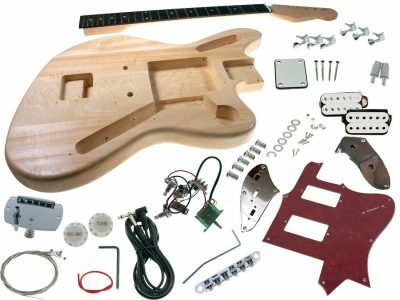 Appear to be comparable with a Squier Standard Strat… I have researched a lot of diy kits and found Solo Gear to be the best quality for the money. Just overall I enjoyed building the kits. Got this in the mail and had a great time building it. Great guitar for the price and I learned a lot about doing a proper setup. Sounds decent out of the box! Neck fit into the body really nice. Neck profile is a bit thick, but could be easily thinned down. Quality kit at a great price! This is Project no 2… it took 2 days to do it. First day was to paint the body and next day to assemble the parts and electronics. I had to shim the neck a bit to have a low action. I thought I had to upgrade the pickups but wow! They sound amazing. The only upgrade I’ll do is to change the nut probably graphtech xl. 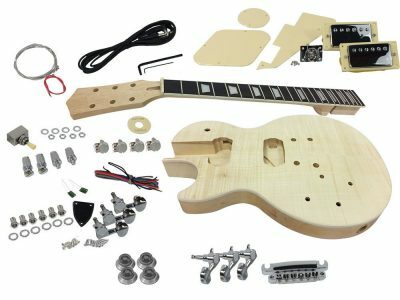 My next project….a les paul style! Enjoy! 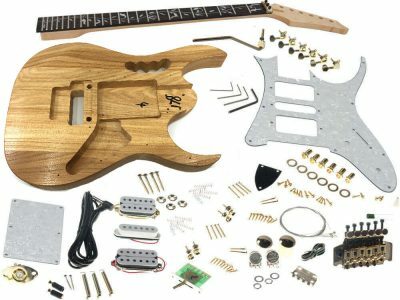 My intention for this build was to replicate the famous Hendrix Woodstock Strat. One of the most iconic instruments in rock history. I was more than delighted to find a Maple capped, maple neck, without the truss rod “skunk stripe” on the back, just like Jimi’s 1968 CBS Fender. I set it up with a “floating” tremolo bridge and it stays remarkably in tune when using vibrato effects. The quality of the tuneomatic bridge made setting intonation and action a breeze. The nut required some modification to get the action where I wanted it and with a minimum of fret dressing the neck now feels and plays great. Thank you for offering an incredibly affordable quality guitar with all the features of a guitar costing many, many times more. So good I bought 2 of them! Easy to assemble and feel awesome to play. I changed out the electronics for fatter, hotter pickups but the stock single coils sounded really bright and crisp. I wanna build some more of these! I built my 2nd Solo Strat for a friend as a Christmas present. This time I went with the classic two tone sunburst of early 50s Stratocasters. I gave it four additional coats of clear lacquer and polished it to a beautiful satin finish with 2000 grit wet sandpaper. Again, I shielded all the cavities with grounded copper tape and it makes the pickups nearly noiseless. By polishing the nut notches and lubing them with synthetic lube gel and graphite, I can swing the “floating” tremolo bar way up and down and it will always return to pitch. I spent a lot of care in dressing the frets and adjusting the truss rod and neck shims, and it paid off with an incredibly low / fast action without any buzz at all. Intonation adjusted perfect and easily. I am very pleased with the sound, look and play-ability of this, my second Strat build. My friend who received the guitar as a gift is also impressed and pleased with the instrument’s performance and look. 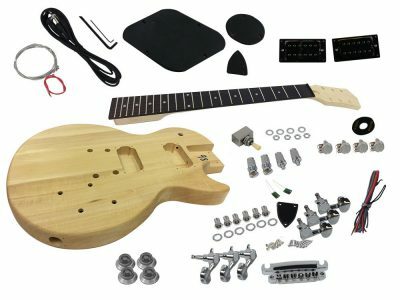 Thank you Solo for offering this level of affordable quality in a kit guitar. I am about 50% complete and I am very impressed with the quality and the workmanship. 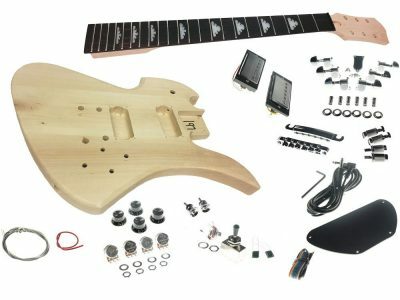 I would like to see some options available when you order such as upgraded tuners, pickups, pick guard colors etc. To reduce costs and increase what I invest, I would like the option of doing all the wiring myself. I will likely order another model in the future as I really enjoy this type of work. I would like to do more of the woodwork but without the tools and a formal workshop, this is a perfect fit. Very good kit. Neck is very good. A nice grain pattern and feels very solid. Some of the hardware is kind of cheap, but I expected that. Good packaging and good shipping time. I’d recommend this kit. Building a guitar for a friend. saw this kit from YouTube, figured why not? For $100, this is so worth it. The shipping was out of Canada, I live in Wisconsin so it was no big deal. Shipping took about a week. Someone in the further down states might have fun with the shipping. Comes in nice, recoverable box easy for storing its parts when your painting the guitar or something along those lines. As for the guitar itself, it was 3 piece wood glued together, dont know why that matters, but I see YouTube people make it a big deal. Rough when you first take it out of the box, but sands down really nice. 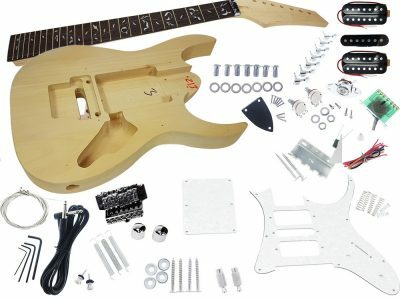 Anyone looking for a strat kit, I personally highly suggest this kit. 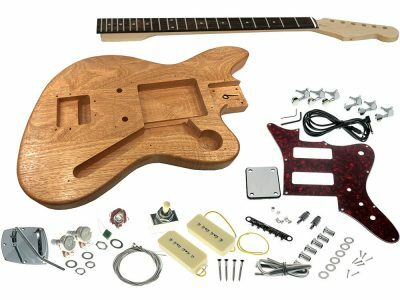 This is my first guitar build and I will for sure get some more from this website. This is my first attempt at a kit guitar but,everything looks good. There is definitely some fret leveling required with mine,but for the money,I’m not complaining. I’ll be buying another kit.